Due to manufacturing issues, Grafix Frisket Film is currently unavailable. It is currently expected to be available again in April 2019. 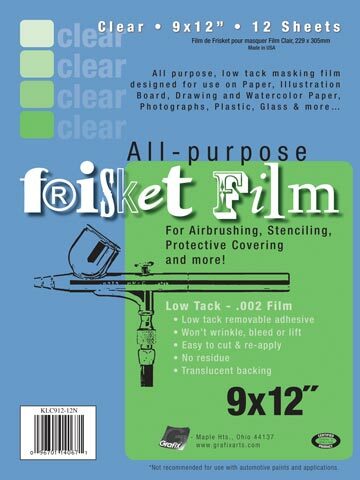 Use Frisket film for airbrushing, retouching, stencils, watercolors and masking. It is self-adhering, removable and will leave no residue. Each roll and pack comes in a .002ml weight with a low-tack adhesive, and features traditional soft peel film that's easy to cut and reapply. Frisket film is excellent for use on hot press surfaces and with most airbrush techniques. Available in all-purpose low-tack and original low-tack styles. Rolls 12" x 4 yds. Rolls 24" x 4 yds. Sheet Packs 9" x 12"